Sampler of the work of the photographer Joan Roth. Two whole plate images interleaved with japanese tissue, a frontispiece, and a cover image set into the cover of the book. They are taken from a handful of originals made in the late nineteen nineties and early two thousands, most usually of the trees in the gardens of her house in Hymenstown, New Inn in County Tipperary, Ireland, but bhere the two centrefolds are of eucalyptus trees in Elk, California. The images are first printed as silver nitrate gelatin prints on mould-made or hand-made paper, exposed lightly in the darkroom from the negative. More detail and darkness is then added by graphite pencil. 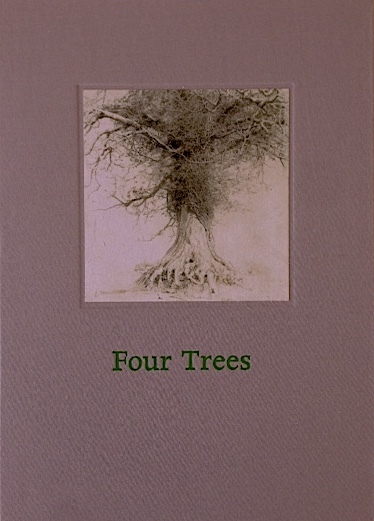 100 numbered copies, printed digitally, casebound, 310 x 225mm, with embossed cover image.